January 5, 1860; the reluctant Bishop of Philadelphia's work on earth came to a close, yet his real work had only begun. Visitors to his grave soon began reporting miraculous favors at his intercession, which led to the canonization of John N. Neumann. Born in Bohemia (Czech Republic), he was considered a bookworm, whose interest was in the sciences. After seminary studies, he sailed to America, arriving unannounced in Manhattan; unsure of his fate like so many immigrants. Bishop DuBois, stating his great need for priests, ordained him June 25, 1836 and assigned his parish; 900 sq miles around Buffalo, NY. Poor, multi-ethnic immigrants and Indians were his parishioners. Walking daily upwards of 20 miles through dangerous territory, he was once nearly hung by bandits. He eventually learned and spoke 12 languages. He developed a special love of kids which blossomed into his most well-known calling; the development of Catholic schools and catechisms. Seeking more personal spiritual growth, he joined the Redemptorists in 1842. He had major assignments in Philadelphia and Baltimore. Rumors started that he would be named bishop. He asked friends to pray against this, feeling very inadequate. He was named Bishop in 1852. Often ridiculed for his simplicity, meekness and poverty, he accepted this as his walk with Christ. In this icon, St. John wears his Redemptorist habit. The red background is the color of the bishop’s robe. John Paul II, who died during the painting of this icon, was buried in his bishop colors. The Feast of the Exhaltation of the Cross held great meaning to him, thus the choice to show him holding a cross of sticks, symbolic of his first chapel built of logs, and his time serving in the American wilderness. The banner is the motto he chose for his bishop’s coat of arms, in English, "The passion of Christ strengthens me." His feast day is January 5. John was the son of Philip, who was German and owned a stocking factory, and Agnes Neumann who was Czech. John was a small and quiet boy with four sisters and a brother, and was named after St. John Nepomucene. An excellent student, John early felt drawn to religious life. He was a seminarian at Budweis, Bohemia in 1813, he studied astronomy and botany in addition to theological topics. John studied theology at Charles Ferdinand University at Prague in 1833. When time came for his ordination, the bishop was sick and the date was never reset because Bohemia had an over-abundance of priests. John decided to go to America to ask for ordination and work with emigres. He walked most of the way to France, then took a ship for America. John arrived unannounced in Manhattan in 1836. Bishop John Dubois was happy to see him as there were 36 priests for the 200,000 Catholics in New York and New Jersey. John was ordained on 28 June 1836, and sent to Buffalo. There the parish priest, Father Pax, gave him the choice of the city of Buffalo or of the rural area. John chose the more difficult country area. He stayed in a small town with an unfinished church, and when it was completed, he moved to a town with a log church. There he built himself a small log cabin, rarely lit a fire, slept little, often lived on bread and water, and walked miles to visit farm after remote farm. John's parishioners were from many lands and tongues, but John knew twelve languages, and worked with them all. John joined the Redemptorists at Pittsburgh, Pennsylvania in 1840, taking his vows at Baltimore, Maryland in 1841, the first Redemptorist to do so in the United States. He was a home missionary in Maryland, Ohio, Pennsylvania, and Virginia and a Rector of St. Philomena church in Pittsburgh in 1844. John was Vice-regent and superior of the Redemptorists in America in 1847 and Bishop of Philadelphia in 1852. He built fifty churches and began building a cathedral. John opened almost one hundred schools, and the number of parochial school students in his diocese grew from 500 to 9,000. He wrote newspaper articles, two catechisms, and many works in German. 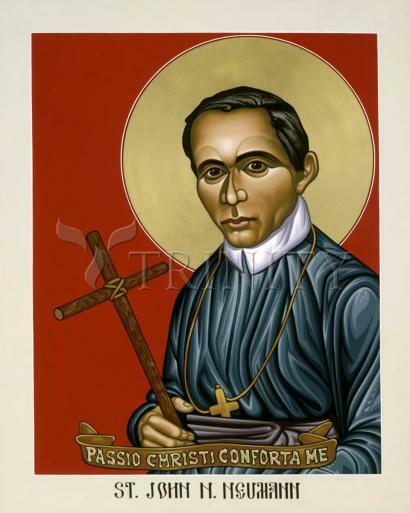 First American man and first American bishop to be canonized.